NEW YORK (CNNMoney) -- Everyone knows it: Donald Trump is rich. Really rich. 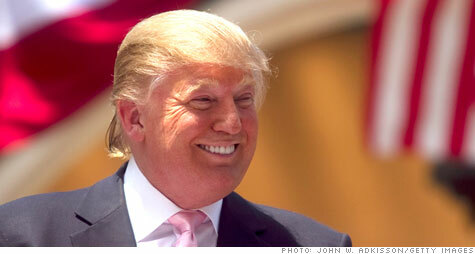 Forbes magazine has ranked him among its 400 richest Americans nearly every year since it started keeping track in 1982. And in his own media blitz, Trump -- who is acting like a candidate, even though he hasn't officially become one -- has been boasting about his wealth. But just how much Trump is actually worth remains the subject of debate and even a lawsuit. Last week, Trump told CNN's Candy Crowley that his net worth is "many, many, many times Mitt Romney," making him a better-suited contender for president. And on Thursday, he reiterated the claim on CNN's American Morning. "Forbes says $2.7 billion. I can tell you that's a very low number. It's much more than that," Trump said, adding if he decides to run, he would provide a financial statement. "I think people will be extremely impressed." For its part, Forbes magazine says it relies on a variety of sources, including "employees, rivals, attorneys, ex-spouses and securities analysts." It includes all assets, from stakes in companies to art to yachts. But because many of Trump's holdings are private companies, their value is not publicly disclosed. Other properties, such as the Trump Soho in New York City, are not actually owned by Trump; instead, he gets a licensing fee for allowing them to brandish his moniker. In addition, Trump is involved in many complicated deals -- making calculating his wealth tricky. In recent years, he's expanded his empire to include the NBC reality show "The Apprentice" and its spinoff "Celebrity Apprentice." At least one reporter who has challenged Trump's value of his opaque pool of assets has ended up in court. Timothy O'Brien, then a reporter at the New York Times, disputed Trump's net worth in his book, "TrumpNation: The Art of Being the Donald," which Warner Books, then owned by CNN's parent company Time Warner, published in 2005. O'Brien put Trump's wealth somewhere between $150 million and $250 million, attributing the figures to people with direct knowledge of Trump's finances. "None of these people thought that he was remotely close to being a billionaire," O'Brien wrote in an excerpt published in the Times. In the deposition, Trump insists he's a bona fide billionaire. "I am a billionaire," he said. "Of course, if you read Tim O'Brien's writings and what was then transposed into the The New York Times, you would certainly not think that. But I am a billionaire, many times over, on a conservative basis." And the book has cost him business, Trump says. "I've lost deals. I've lost specific deals because of it," he said. Throughout the deposition, Trump sparred with O'Brien's lawyer, Andrew Ceresney, over how the real estate tycoon determined what he was worth. Trump: I would say it's my general attitude at the time that the question may be asked. And as I say, it varies. But the deposition shows Trump's valuation of his properties can be at odds with others' views. "Donald owns 40 Wall Street, which he spent about $35 million to buy and refurbish in 1996," lawyer Ceresney read from O'Brien's book. "The building has about $145 million in debt attached to it, and New York City assessors value it at $90 million. Donald values it at $400 million." Trump reacts to the passage by saying: "Anybody would understand that a city assessment is 15 and 20 percent the value of a building." When questioned about the return on his investment from several golf courses, Trump said he does his own math. Ceresney: Have you ever done a projection as to how much you anticipate you will profit on these courses over time in light of the contributions that you're making in cash? Trump: Yes, I've done mental projections. Ceresney: These are projections that you've done in your head? Though Trump acknowledged that he provided O'Brien with financial statements showing his wealth at $3.6 billion, he said the actual figure is closer to $6 billion. "These statements ... never included the value of the brand. And there are those who say the brand is very, very valuable," Trump said in the deposition. O'Brien's book tainted his name, The Donald said. "My reputation was severely hurt. It was damaged and therefore my brand was damaged," he said. --CNNMoney senior writer Tami Luhby contributed to this article.